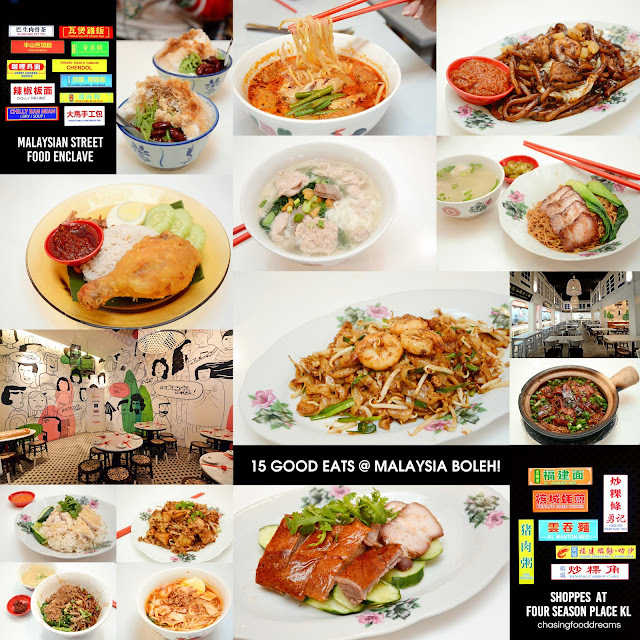 CHASING FOOD DREAMS: 15 Street Food to Eat at Malaysia Boleh! 15 Street Food to Eat at Malaysia Boleh! Malaysians are blessed with plenty of good eats always. Adding to the list of good eats in our metropolitan city is Malaysia Boleh! Located at the newly open Shoppes at Four Season Kuala Lumpur, Malaysia Boleh! 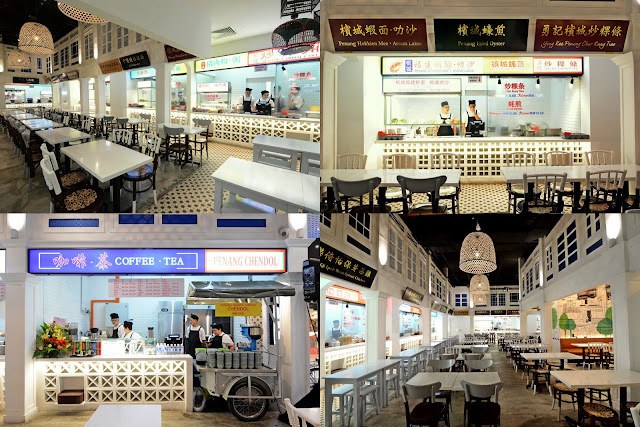 is a non-halal food court that rounds up some of the best street food from all over the country in one place. The new food haven has more than 20 classic street food that is a sure crowd pleaser, especially the working crowd in the city. Owned by Singapore’s Fei Siong Group, Malaysia Boleh! had a grand opening recently and was attended by many VIPs including Singapore Deputy High Commissioner Mark Neo and other local celebrities. Malaysia Boleh! food enclave has had its first success in Singapore and is now making its mark in the country where all the food originates. The auspicious opening ceremony was also graced by the famous Kun Seng Keng Lion Dance troupe for a big bang celebration. The food enclave has a modern theme, showcasing Malaysian local cartoon mural, white washed walls, mosaic floors, minimalist white table settings, lighting made from bird cages and fish traps and more. It’s nicely air-conditioned and bright, making dining comfortable. In no particular order, one simply must-try the Yong Kee Char Kuay Tiao (RM9). Expect a good hit of breath of wok with slivers of soft rice kuay tiao well-seared and flavoured with soy sauce and chili paste. Additions of bean sprouts, chives and prawns are much expected as it gave the kuay tiao its delicious texture. The Penang Fried Oyster (RM12) is also sublime. Starchy bits along with egg and plump baby oysters are best savored with the chili sauce on the side. Pudu Barbeque Roast Duck + Char Siew Combo (RM15) is a good choice when one cannot decide which roast meat to try. Succulent roast duck and glistening crystal char siew is nicely roasted, make it delicious on its own or with rice and noodle. 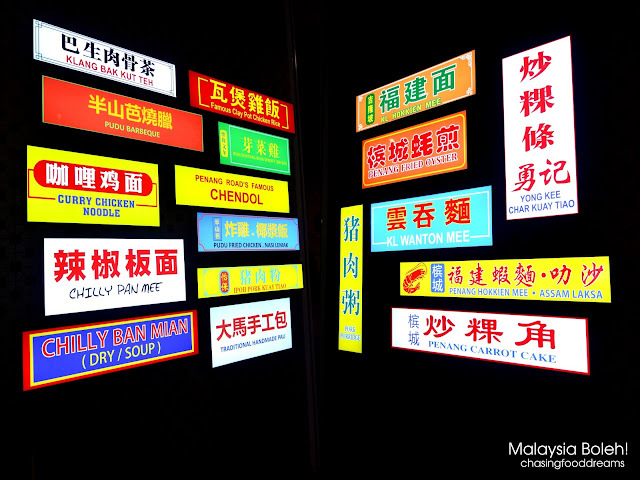 Malaysian’s ultimate street food of nasi lemak is also available here. Made famous in the street of Pudu during late night, the Pudu Nasi Lemak with Fried Chicken Drumstick (RM9.50) has fluffy coconut tinged rice with spicy and sweet sambal that goes well with the crispy fried chicken. The Hee Koh KL Wanton Mee (RM9) is sufficiently satisfying with springy soy sauce and aromatic oil laced noodles served with pieces of roasted char siew and plump wantons. For the full lardy flavours of unctuous crispy lardons, order the KL Hokkien Mee (RM12). A dark hodgepodge of dark soy sauce braised thick noodles with pork slices, prawns, cabbage and chu yau char, this plate of noodles will always be a crowd favorite at any time of the day. Another good eats that has many queueing up for is the Penang Carrot Cake (RM8). Cubes of rice cakes fried with lots of preserved choy poh and garlic, flavoured with soy sauce and chili and finished with egg is so yummy. 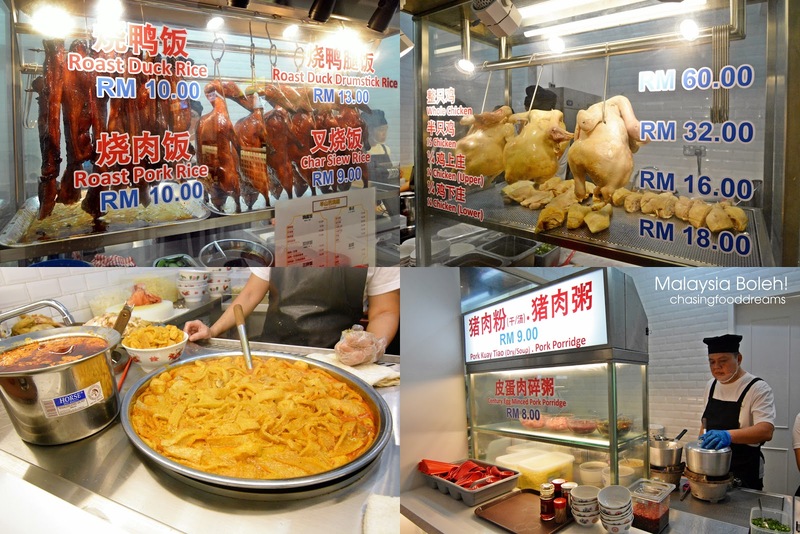 One simply can’t go wrong whether you opt for the Pork Porridge (RM9) or Pork Kuay Tiao (RM9). Both are cooked well with lots of porky delights and flavored with a delicious porky note. The addition of gelatinous curry braised pork skin is what gave the Jalan Imbi Ah Yen Curry Mee (RM9) its signature flavour and texture. There’s also poached chicken, beancurd puff and long beans in this bowl of slurp-ilicious curry noodle. Simple and familiar flavours in the Le Qi Ipoh Bean Sprout Chicken (RM10) makes this classic a constant favorite for many that ultimately enjoys a tasty poached chicken on chicken oil laced rice. The Claypot Chicken Rice (RM10) also makes a solid one pot wonder with well-marinated chicken pieces along with Chinese sausage slices cooked on rice in claypot. Aromatic from the finishing touches of more soy sauce and wine with sprinkling of scallion, the rice is delicious, especially the bottom crispy bits. Ban Mian evokes homecook flavours like no other. Springy and doughy noodles made from scratch, cooked in soup or dry style and topped with minced meat, shredded black fungus, crispy anchovies and blanched vegetables sums up Yoko Chilly Ban Mian (RM9) in one word… yum! Calling all Penang asam laksa lovers! Though the Penang Asam Laksa (RM10) is not the best but one is assured that this bowl is pretty decent when it comes to that pungent sourish asam laksa flavour in the city. The Penang Prawn Mee (RM10) is also worth a try with noodles in tasty prawn stock topped with poached shrimp, pork slices, boiled egg, kangkong and crispy aromatic fried shallots. Last but not least, the Penang Road Chendol (RM3) is absolutely divine! Make sure to order this dessert to finish your meal at Malaysia Boleh! For a mere RM3, the sweet icy dessert has a rich gula melaka that makes this one of the better chendol in the city. Must-order!! Business Hours: Daily from 10am to 10pm.